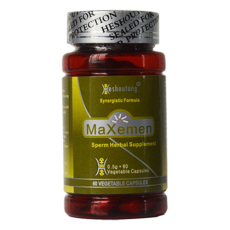 MaXemen is formulated for nourishing kidney energy for making better quality sperm. It mainly used for no sperm, less sperm or low activity sperm, it also works for impotence. Usage & Dosage: 3 Capsules per time twice daily before meals.